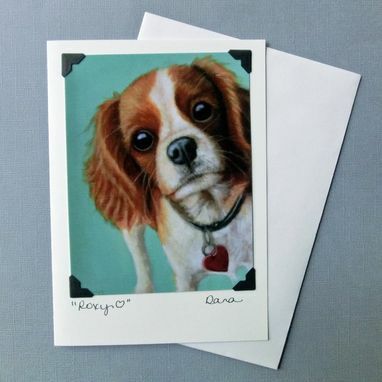 This animal art magnet is created from an image from my original oil painting of a sweet Cavalier King Charles Spaniel. It measures approx. 2 x 3.5 inches and is printed on matte cardstock, mounted to a magnetic backer and hand-trimmed by me. It is enclosed in a cellophane wrapper and contains a note indicating that 10% of the purchase price is donated to one of the local animal groups where I am also a volunteer. Please note that the image of my painting above is protected by copyright law. Any reproduction or copying of the image is illegal. This copyright will not transfer with the sale of this work. Note about shipping: I look for the most cost-effective shipping method for your purchase and refund shipping fees if you have overpaid by a dollar or more. If you are ordering a number of small items from my shop, they can often be shipped together in a US Flat Rate shipping envelope or box for only $5.35. I can also arrange for express shipping if needed. Just contact me.